When my husband and I are traveling for his work, I commonly find myself working out of hotel rooms for three days to a week. I like having somewhere that feels more like home, so we often stay at the Homewood Suites since they have their own mini kitchen. Since we have stayed at this one location many times, I have started to get to know some of the maids who normally clean the rooms. Many of them have a difficult time speaking English and are excited when someone even attempts to communicate with them. As much as I hate to say it, I have always felt guilty when they tried talking to me and I couldn’t really understand what they were trying to tell me back. I am one of those people who always tries to show respect to others, so it’s hard for me not being able to communicate with these great ladies. This is why when I was asked to review Maid to Translate, I was pretty excited, thinking this could very well be something to help me better understand some of the Spanish speaking people not only in this hotel, but in my local community. Have you ever found yourself feeling frustrated talking to housekeeping staff when you stay at a hotel, or possibly in your own home? 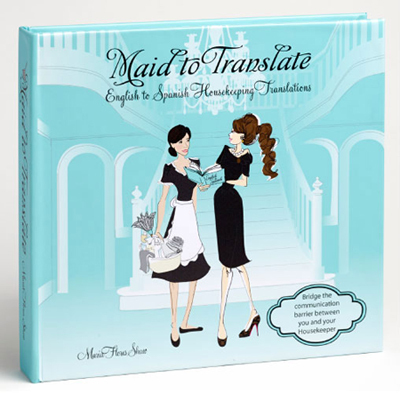 Maid to Translate is a new, innovative book intended to enable housekeepers and their clients to communicate with one another. While the concept may seem odd to many of us, we all understand how frustrating it can be for everyone involved when there is a language and culture barrier. Through colorful pictures and a great design, nearly everyone can learn how to speak some Spanish when it comes to common words in your own home! I will admit, this is a fairly large book and is not just a communication book, but a comprehensive guide on cleaning. I have to admit, I learned some things (and words) related to cleaning that I didn’t even know existed! With the detailed pictures and words in both languages, it reminds me more of an elementary level language textbook. Obviously there is nothing wrong with this, since this is what many schools have been using for years to teach languages. I think the familiar, friendly layout Maid to Translate is what make it an educational, and sometimes amusing read. I will admit, I was a bit unsure what to think of this book. While I do not have a Spanish speaking maid (or any maid for that matter, much to my house’s dismay), I did find many of the cleaning tips interesting, as well as how to say some common words in Spanish. This book can really help any communication gap between a Spanish and English speaking person, allowing them to better communicate. While many of the words are in a cleaning context, they can easily be used outside the home, allowing you to brush up on your Spanish. Based on my own use of Maid to Translate, I am happy to give it an A- rating! Looking for a gift for someone who might need some help trying to communicate in Spanish? If so, we think you will love Maid to Translate! This book is currently available on the Maid to Translate website for $35. Hello Susan, I am the author the Maid to Translate a book your recently blogged about. I was very please that you gave the book an A-rating WONDERFUL! your review was right on. Except for the part "perfect gag gift for dirty Santa exchange". Maybe you were trying to bring some humor to the review; I took it as an insult! The book is not only a great tool but it's also beautifully illustrated. This book does not fall into the gag gift category. I know you received a free copy. I'm happy to give it away. But that one line in particular was difficult to swallow. If you can graciously take time to edit/remove that one line I would highly appreciate it. Much& House would to. I would love to include your article in one of my blogs and promote budget earth only if the one line is removed. Look forward to hearing from you.